"Thirty years of hurt" the song goes, and it's just as relevant in Brazil as it was for England back in 1996. A bitter feud for Brazil's 1987 football championship has finally been laid to rest by judges. The judges said this was the final whistle on the matter, but the clubs' Twitter responses begged to differ. Sport Club do Recife said that 1987 was "indisputably ours, again... In court, once more, Sport beat those who ran away." 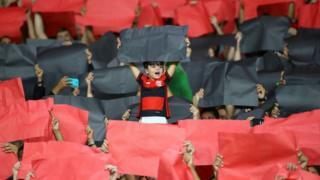 Flamengo wrote "in the field, on the ball, always Flamengo. Champions of Brazil 1987". At the time, a dispute led to two leagues running at the same time - a breakaway competition that was won by Flamengo and the traditional Campeonato Brasileiro organised by Brazil's football confederation, which was taken by Sport. The confederation tried to get the two to play off for the overall title but the Rio-based Flamengo, one of the biggest clubs in the country, refused. So Sport took the slot in the Copa Libertadores, South America's Champions League. The panel of five judges gave Sport a 3-1 victory. One of the justices abstained as his son was linked to a Flamengo lawyer. But the judges were clearly unhappy that the ball had been put in their, erm, court. Justice Luis Roberto Barroso voted to split the title between the clubs, saying: "There is no place worse than the judicial system to discuss sports."